Off we went to teach a sold out class how to make Paska. .Zwieback and Green Bean Soup. My confidence had grown since the last class and so the anticipation of sharing the recipe that was passed down to me was nothing less than a blessing and wonderful opportunity. Had Grandma lived to know her Paska recipe would appreciated by so many she surely would have blushed. Judy was demonstrating Zwieback and so her and I each made a batch of dough an hour before class arrived so that we could seamlessly demonstrate making dough (another batch) and then pan our dough onto pans. Bev was our Green Bean Soup demonstrator and it was fun to quiz the class to see who knew what the most significant herb is in the soup ..and then to see who knew what it was in German. The class had a wonderful range of participants aged from young women all the way to Oma's. Ellen ..shared authentic Russian Paska Spread which can only be described as Souffle light fluff which pairs just beautifully with Paska. I just feel incredibly humbled and blessed for the opportunity to share what we've been taught by our mothers and grandmothers with the next generation. The ladies that came to learn and watch are so gracious in allowing us to learn to teach in their presence. 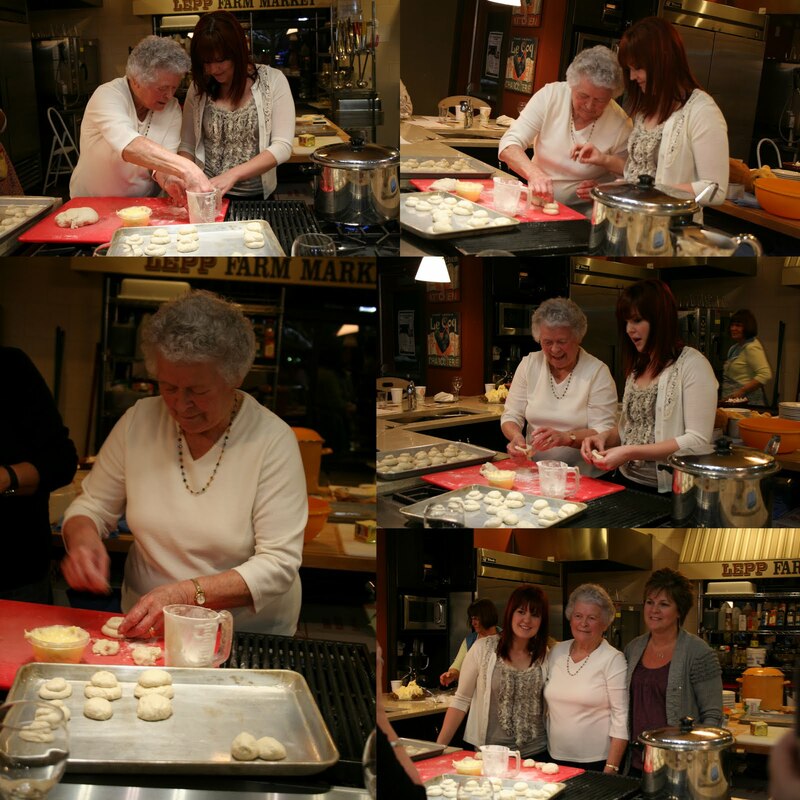 Charlotte Lepp's Mom and daughter joined us on our side of the counter to do some Oma/granddaughter teaching of Zwieback. What a treat to see the three generations side by side enjoying a task that has been handed down through the generations. We are so excited to be partnering with Lepp Farm Market to equip the kitchen at Matthew's House. All the proceeds of the classes are being donated ...both the girls and Lepp's. Wondering when the next class is? You can check their schedule here on their website. I wish you a very special week dear ones. What a wonderful evening! If you ever come to the east coast, I'll be first in line to join your class! Fun night...I can vouch for that! I love the vibrant colours of the produce at Lepp's. Now if only they were in my neighbourhood! Now when I look back, I can say it was fun...everyone there helped set the stage which made it enjoyable for all of us. Great organization and all the support made it a successful evening of production and laughter. Guess what's rising at my end of the valley? When I saw Ellen's post last night at Mosaic Monday, I was so excited. Her Paska topping just sounds so good and I am eager to try it. You gals just look as if you're having such a fun time. Maybe you'll all visit NYC! You got some great photos Lovella. 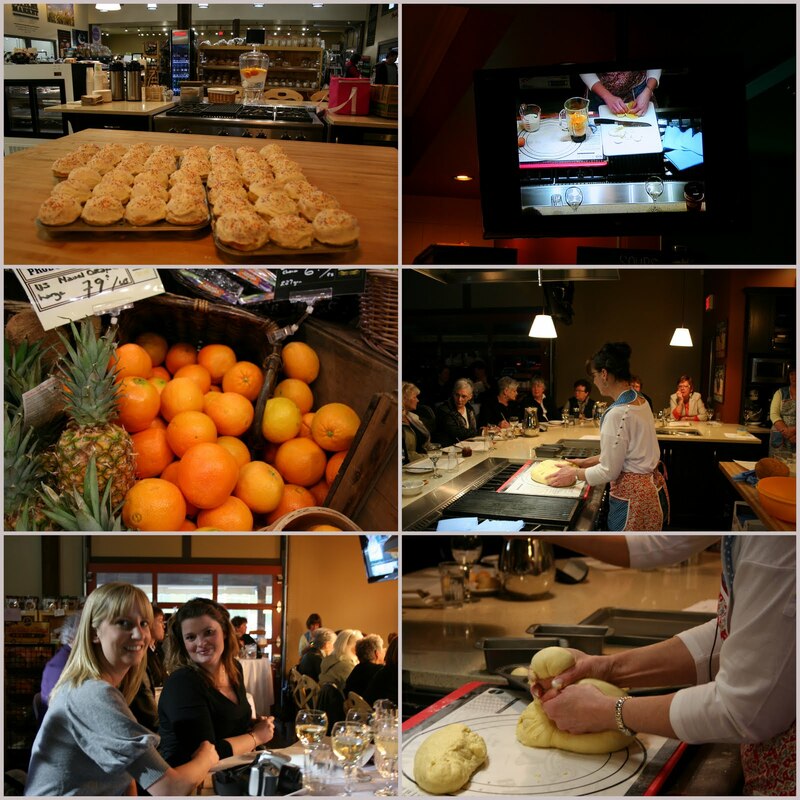 Such a fun night in the kitchen. I had comments about the great aprons you made for all of us. Hope you have a great Easter week! 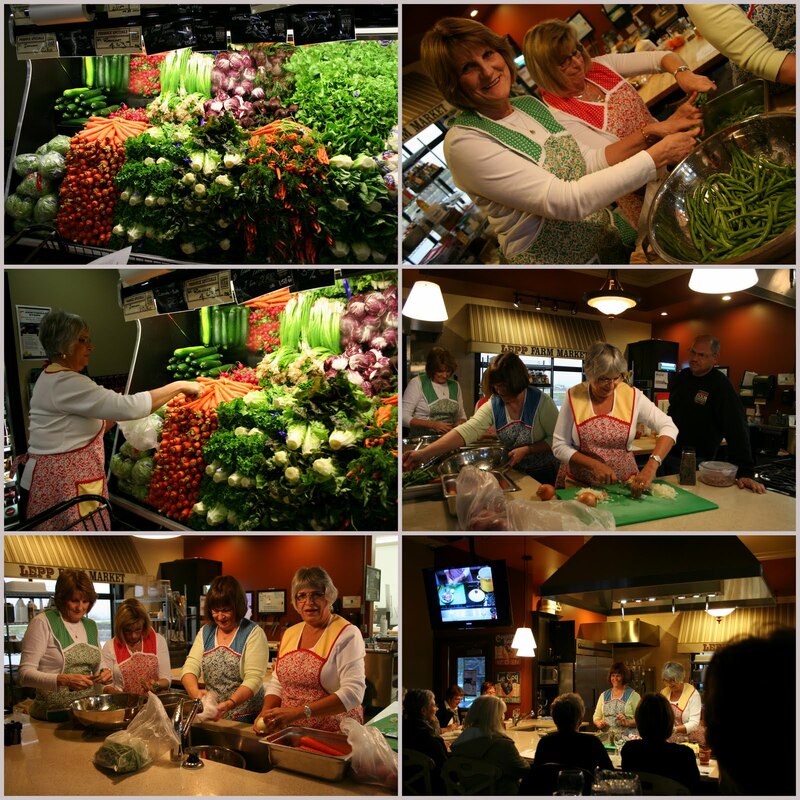 It is wonderful how the MGCC group is branching out and reaching so many with your recipes! Looks like a lot of fun too. That looks like the total ultimate of fun!!! Great job --- all of you. The kitchen set-up is beautifully designed for class demo's. 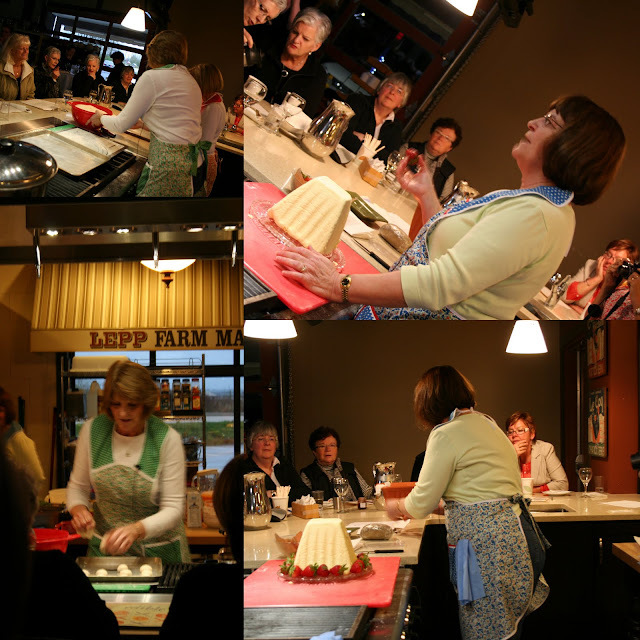 In the olden days when I was a home ec teacher, I loved giving cooking demo's to my students. They loved watching what was going on in the big mirror overhead. And most of all, they loved eating! Lepp's looks like a great place! Looks like everything went well. Aprons, food, friends, guests...sounds good to me. I enjoyed seeing you all in action and having fun together. I am thinking just what a privilege it would be to attend some of your classes. Believe me, I would be right up there in the front row taking it all in. You guys are taking the world by storm, with your cooking skills. Thanks for sharing.